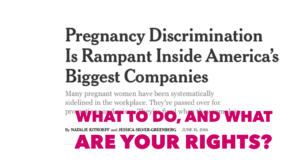 NYTimes says Pregnancy Discrimination is rampant. What Rights Do You Have? Your company must have a conversation with you about your needs when you’re pregnant, and it has to “reasonably accommodate” you – that’s the phrase for having a little flexibility when you are pregnant. Must Employers Meet the Reasonable Needs of Pregnant Employees?